It is vitally important to encourage young children to exercise. This is not always the simplest task, as exercise can seem like a chore to a child when compared to other activities such as playing video games or watching television. Convincing children to play outdoors has grown especially difficult in recent times, and we have seen a rise in the obesity epidemic as a result of that. Luckily, PlaygroundEquipment.com has the best, most fun playground equipment on the planet available for sale, ready to encourage children of all ages to get outside and play! Any tire swing kit that you order from PlaygroundEquipment.com is guaranteed to provide children with hours of safe, enjoyable exercise that they will look forward to every single day. We carry the best tire swings that children and adults alike will love. All of our products are made with the safest, most durable materials, so our products are safe to use every and any time. Because we use such strong materials to make our tire swings, we guarantee satisfaction. 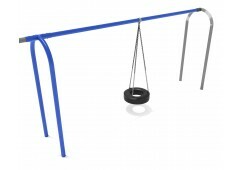 PlaygroundEquipment.com ensures that all of our kids tire swing sets come with a heavy duty tire swing swivel to guarantee safety when the swing is used. If your tire swing kit is defective in any way and needs replacement parts, our warranty program has you covered! When you place an order for tire swing kit delivery with PlaygroundEquipment.com, you can rest assured that all of our products will come with the parts that they should, including the heavy duty tire swing swivel. Your order is guaranteed to be shipped to you on time and in excellent condition. We hold our products to the highest national safety standards, and promise all of our customers' satisfaction with all of our products. If, for any reason, you are unsatisfied with your tire swing order, reach out to our amazing customer service representatives, who would be delighted to serve you in any way possible. So what are you waiting for? Trust PlaygroundEquipment.com for all of your commercial and residential playground needs. We are a family-oriented business located in Greenfield, IN. All of our employees are dedicated to supplying top quality commercial playground equipment to thousands of clients across the United States. Let us be your one-stop-shop for all of your safe playground equipment needs. Contact us today to request a quote on any tire swing set or buy online and have your order shipped out in 3-5 days!